FuBar uClock is my own personal re-write of FuBar ClockFu, with all the cruft removed. - It can show realm time and/or local time on the FuBar. - It shows today's date aswell as realm time and local time in it's tooltip. For LDB fans a Broker version of uClock can be found here. - Updated for WoW 4.3.0. - Updated for WoW 4.1.0. - Updated for WoW 4.0.6. - Added UTC time format support. - Updated for WoW 3.2.0. - Fixed compatibility issue with GroupCalendar v5. - Updated for WoW 3.1.0. - Added an option to show local time, realm time, or both in the display. - You should now be able to choose the colour of the text displayed in FuBar (default is white, text in the tooltip remains yellow). - Updated for WoW 3.0.2. 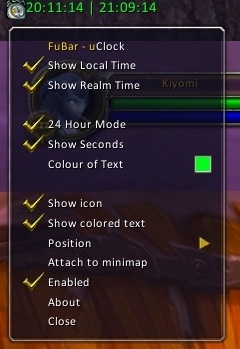 This is a kickass addon, finally I can remove that big calendar button from the minimap. But please, could you add an option to get UTC time? The standard Fubar_ClockFu shows UTC, which is useful in europe when coordinating events, since UTC is neutral. Last edited by Yewbacca : 04-27-09 at 01:35 PM. I've been working on various options to set what goes where. I think I'll expand on your idea and allow users to choose Local Time, Server Time, or Both Times shown on the FuBar. Perhaps also if Local or Server is chosen the other time will appear in the tooltip, and if Both are shown then no time will be in the tooltip. I'll have a fiddle about and see what I can do. Would you consider a toggle to change the Fubar time to server time and tooltip to local time? My local time clock is right next to my montior so I immediately know what my time is. I live on the east coast but play on a west coast server so knowing the server time is more important at a glance rather than mosuing over for the time. 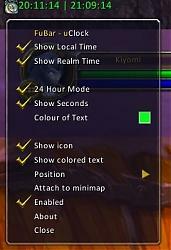 Any chance of giving the option to disable the clock on the Minimap when enabling uClock? Sure, I'll add this in the next release. You pretty much answered yourself there. uClock is designed as a FuBar plugin. I don't really want to give uClock users an option to create a myClock clone. That does pretty much destroy the point of it being a FuBar plugin. EDIT: I've thought long and hard about this and decided that I might actually do it. I'll have a fiddle around and see what I can do. If anyone else manages to come up with this I might add their work to mine. Last edited by Ethan Centaurai : 11-05-08 at 08:15 AM. One more thing, not really important but if it is not too difficult to do: when attaching uClock to the MiniMap, can it be a digital clock instead of the clock icon? Even if I could the text would probably be teeny-tiny and unreadable, so I think I'll pass for now. If someone else manages to get this to work though, then I'll consider adding it. This is probably getting beyond the purpose of a FuBar plugin, but I'll ask it anyway: how about an option for a separate frame, similar to MyClock? Whoops! I forgot to say "please?" Last edited by Jaim Sandar : 11-02-08 at 08:58 AM. Really great! Thank you for fixing the problems and adding the GroupCalendar thing. Last edited by Jaim Sandar : 11-01-08 at 10:50 PM. Just wanted to let you know everything is working great now. Whoops sorry about that! This has also been fixed and that should be the last of the problems for now. Once that gets fixed, I would like to see the shift-click open Group Calendar, if it is installed, rather than the Blizzard calendar. Would that be possible? The Blizzard mini-map clock does that, but I imagine it is done by Group Calendar. GroupCalendar alters the big button on the minimap to add toggle-ability. I've added this to my "To Do" list. I don't use GroupCalendar myself but I'll have a look and see how they do it. Last edited by Ethan Centaurai : 10-31-08 at 03:44 AM. I am getting a similar error as Twidget, and no right click menu. Last edited by Jaim Sandar : 10-30-08 at 08:16 PM. Message: LibRockConfig-1.0: Field "desc" not found for `FuBar_uClock->Choose whether to show seconds'. Hope all this helps to narrow the problem.